I get it. I get that as any part of a development there is a point where what happens at the edges of the development are no longer in the hands of the developers and it becomes an issue for the council officers, in particular Highways. However I think Curo have a lot to answer for here. They have a blank canvas to build on. Their focus appears primarily on connecting the development via a cable car to the city centre. They seem to have ignored the vibrant Combe Down village centre on their doorsteps. Highways have done little to help here either. The artist impression of the entrance. Note the large swathe of green space with the pavement as close to the roundabout as possible. 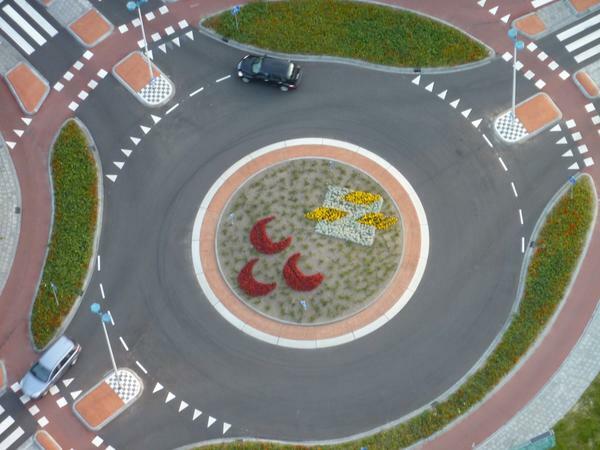 The Highways approved 28 metre diameter roundabout design. If we look at “community” areas around this junction we can get a feel for where children and young adults “need” to get to, other than the city centre. Desire lines for children and young adults from the Curo Mulberry Park development. What I see, looking at the map above, is a network of mostly flat roads excluding the route down to Bear Flat and Monkton Combe. What I don’t see is Highways doing anything to create a cycle-able route suitable for 8 year olds. This really is a perfect opportunity to create the beginnings of a cycle network on the hills of Bath. 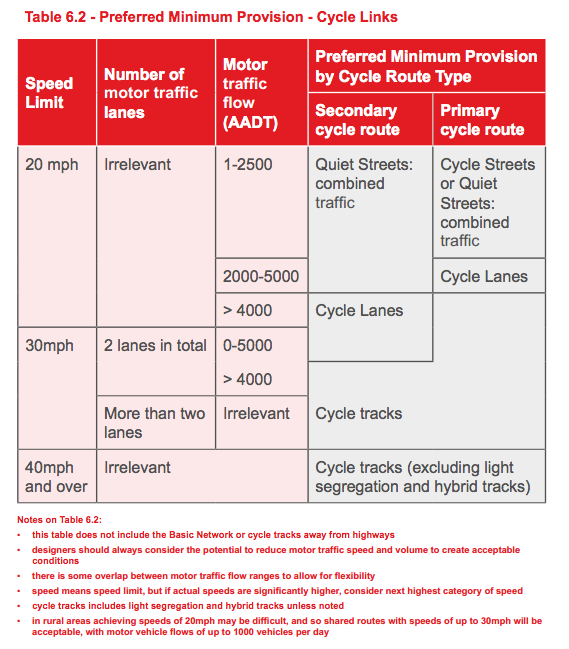 Firstly Highways do not have a mandate to have to do a Cycle Audit on the scheme. Using the Welsh Active Travel design guidance which borrows much from the Dutch CROW manual, Bradford Road should be providing cycle tracks to connect the multiple schools together. The above table dictates that this 30MPH road should have protected cycle tracks on it. It’s too busy and fast not to. This road is exceptionally busy between 8 and 9am, around 3:30pm and again 5-6:30pm. Due to the hostility of the road, you do not get a lot of children cycling and walking to school along Bradford Road. Highways should be recognising this road as a critical road for children and should be trying to create a safe space for people to make the choice, not to drive their kids to school. 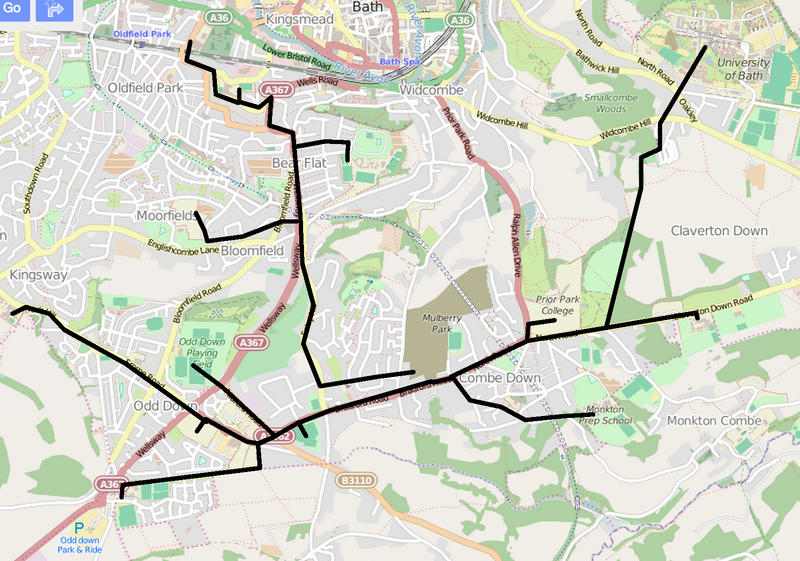 Highways should be looking at creating a two way cycle track on the south side of the road with a plan to connect the communities of Odd Down and Combe Down together. 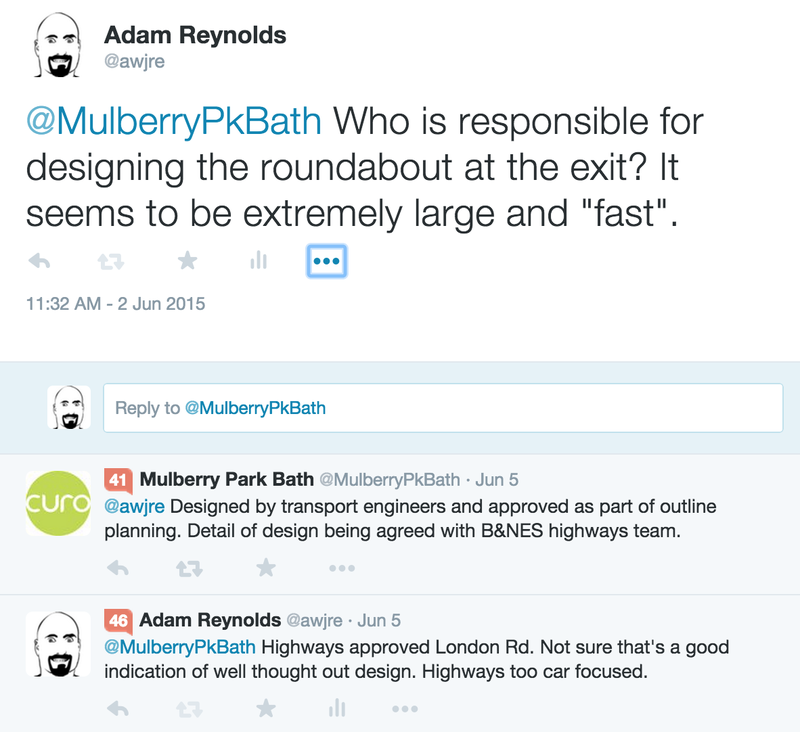 Which then brings me on to the Mulberry Park Roundabout design I would like to see. Note more space taken from the “green” entrance to provide a safer entrance into the development. A very rough idea of what Mulberry Park exit should be with a major focus on providing good walking, cycling, and driving connections to the surrounding communities. 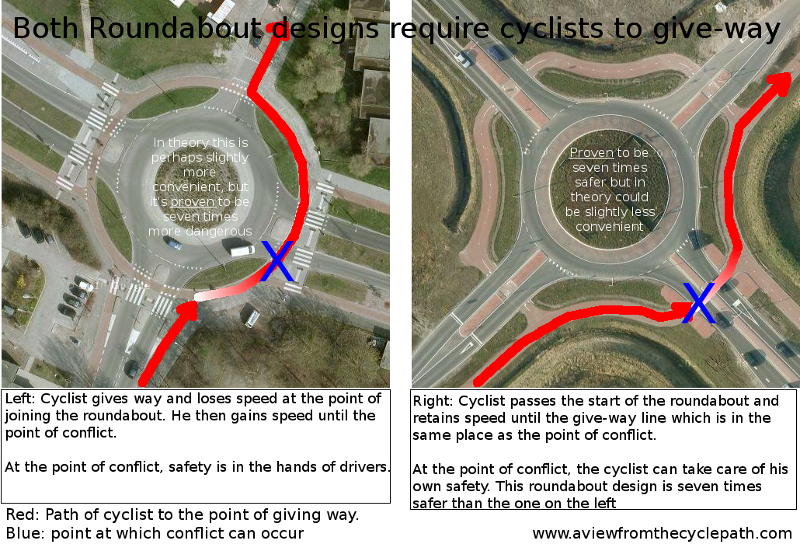 David Hembrow pointed out to me that the example roundabout I’d chosen is not as safe as it could be. What I’m saying is that when you defend yourself with Highways “approved”, it’s the same argument building companies use when describing their houses as compliant to modern British building standards. These are minimum standards. Curo should be aiming for better than “minimum”, because, if the BaNES Highways department can approve London Road, then it appears it can approve a scheme that, by my calculations gets it 30 out of 50 points in the Cycle Audit with two critical failures that would need to be addressed before this scheme should be allowed to be built. BaNES Highways has a lot to answer for. Mostly it keeps coming up with answers that prioritise the car, not walking and cycling. When you develop a new 600 home housing estate and build a primary school right at the heart of it, those children will grow up and need routes to other schools. Highways should know this and be planning for this. When the biggest employer in Bath (the Uni) is a flat cycle ride away, then Highways should be planning for this. Is it too much to ask that Highways create a two way cycle track linking St Gregory’s to Ralph Allen? Is it too much to ask that on street parking on 30mph roads is a secondary concern to the provision of protected cycle lanes? At what point is pollution and congestion an actual priority with Highways? When will the residents of Bath get the Highways department they deserve, the one doing all it can to provide safe walking and cycling routes. A department focused on delivering safe modal share on all roads and not focused on traffic flow models. Models where PCE (Passenger Car Equivalent) values are skewed massively against bicycles (0.2 vs a car being worth 1). So Curo, seriously, do not justify your crap, poorly thought out design that isolates the children living on your development because “Highways said it was ok”. You can do so so so SO much better than that. Bradford Road needs a protected two way cycle track linking all the schools together and the roundabout at Mulberry Park is the first link in the chain. Those “10 potential parking spaces” is the beginnings of a cycle track 1000s of children can cycle to school on. A track 1000s of people can use to cycle to the University and Wessex Water. Something that will make people fitter, physically and mentally healthier, take less time off, be more punctual, and more productive while at work or school. Oh and save the NHS a bloody fortune. Both of you stop failing our current and future generations. Catch up with what the rest of the world is doing. [Addendum] The two way cycle track can be implemented without changing road widths. You just need, paint and glue on plastic bollards. The type of temporary “trial” changes our new Council Cabinet Member for Transport would like to see more of. You are so right about this Adam. This is such a great opportunity to do something better than Bath has ever had and lead not lag far behind. Not only is Bath University a flat ride away, but so is Wessex Water – another major employer in the city. The council and Curo should be looking to support and enhance the existing shops and services at Foxhill, Combe Down and Odd Down on the back of this development but in a way that avoids adding to the already dire traffic mess. No-one in their right mind would put an 8 year old on the roads as they are now, but actually that is exactly what should be possible. My rcent visit to Freiburg in Germany reminds me just what can be achieved when there’s the will to do so. Our problem is that those with power and influence in Bath seem to lack both the imagination to see how things could be better and the will to achieve better. In Britain, with a compromised execution and relying upon British drivers’ behaviour to keep cyclists safe, expect that there would be an even larger difference in safety. One other small thing. The minimum provision table which I think you got from a Welsh source falls very far short of Dutch practice. The CROW recommendations may appear not to be so far removed from this, but they are treated as absolute maximums over here. Cycle-tracks away from the road are not all uncommon by 30 km/h roads in NL even if the traffic flows are nowhere near 5000 per day. Good point. I’ll update it now.